For in-game updates, news and more for all Dana Hills High School sports programs, follow us on Twitter @SouthOCSports. Dana Hills added two more dominating wins to stay unbeaten in the Sea View League. With a 31-point win over Mission Viejo on Jan. 25 and a 41-point win over Capistrano Valley on Jan. 30, the Dolphins (14-8, 6-0) are on the precipice of their first league title since 2013. Dana Hills stars continued to shine in the win over Mission Viejo. Sophomore Maicie Saia scored 23 points and added five steals. Junior Maya McArthur put together another double with 13 points and 10 rebounds. It was her 14th double-double in 18 games this season. Olivia Chambers had a strong night with 14 points and eight steals. Against Capo Valley, the Dolphins put the hammer down in the fourth quarter. Dana Hills outscored the Cougars, 24-5, in the final frame to equal their largest margin of victory this season. Dana Hills beat Newport Harbor, 59-18, on Nov. 30. Dana Hills had an opportunity to clinch at least a share of the league title against Laguna Hills on Feb. 1. Results were not available at press time. 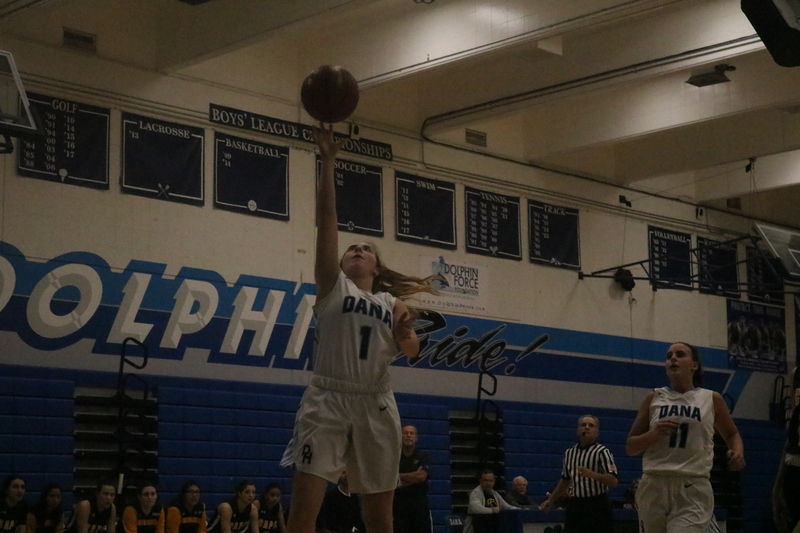 Dana Hills won by 20 points at Laguna Hills on Jan. 22. Second-place Trabuco Hills only has one league loss, 45-40 against Dana Hills on Jan. 16, and has three games remaining. Dana Hills and Trabuco Hills will likely play for the outright league championship in the season finale at Dana Hills on Wednesday, Feb. 7. Dana Hills earned seven second-place finishes at the Coast View Athletic Association finals on Jan. 27 at Capistrano Valley High. Captain Kian Abedi, ranked No. 3 in the county at 170 pounds, took on county No. 1 Cody Burdette of Trabuco Hills in the title match, but Burdette won by pin. Erick Carreno (106 lbs. ), Miguel Rodriguez (126lbs. ), Gavin Walker (132 lbs. ), Colin Reider (138 lbs. ), captain Levi Jones (145 lbs.) and Josh Harkey (182 lbs.) all found the podium in second place for the Dolphins. By finishing in the top five, all seven wrestlers advance to the CIF-SS Coastal Division Tournament on Friday, Feb. 16 at Westminster High. On Feb. 1, Dana Hills earned an at-large bid to the CIF-SS Southern Division Dual Meet Championships on Feb. 3 at Redondo Union High.